River of Grass: Somewhere Between (work in progress) screens on Sat April 20 as part of Dessane Lopez Cassell’s juror program. Sasha Wortzel with Morgan Bassichis. Mark Aguhar, Felipe Baeza, Morgan Bassichis, David Antonio Cruz, Amaryllis DeJesus Moleski, John Edmonds, Mohammed Fayaz, Camilo Godoy, Jeffrey Gibson, Hugo Gyrl, Juliana Huxtable, Rindon Johnson, Elektra KB, Linda LaBeija, Park McArthur, Elle Pérez, LJ Roberts, Tuesday Smillie, Tourmaline, Kiyan Williams, Sasha Wortzel, and Constantina Zavitsanos. Happy Birthday, Marsha! screens with Blame by Quinn Shephard as part of the opening program for the series The Future of Film is Female, organized by Caryn Coleman, guest curator, and Rajendra Roy, The Celeste Bartos Chief Curator of Film, at The Museum of Modern Art. Video installation Lost in the Music will show on a yearlong loop as part of She Persists: A Century of Women Artists in New York at the Gracie Mansion Conservatory (opening January 22). Happy Birthday, Marsha! will be included in the Nottingham Contemporary’s Still I Rise: Feminisms, Gender, Resistance exhibition and show in the Sharjah Film Platform in January. In February Happy Birthday, Marsha! screens at the Museum of Modern Art and will also be installed at the Brooklyn Museum in the exhibition Nobody Promised You Tomorrow: Art 50 Years After Stonewall (May 3–December 8). Through movement, text, and music, Yanow creates an intimate history of the Jewish Borscht Belt, mental illness, cultural assimilation, political repression, and gender trouble, from the Bronx to the Catskills. Tourmaline and Sasha Wortzel: Happy Birthday, Marsha! Tourmaline and Sasha Wortzel present a live immersive screening of their film Happy Birthday, Marsha! which imagines iconic activist and performer, Marsha "Pay It No Mind" Johnson in the hours before the 1969 Stonewall Riots. The evening will include performances by intergenerational collaborators on the project including Mya Taylor, Jimmy Camicia, Egyptt Labaija, and Geo Wyeth, who will score the film live. Organized by Lumi Tan. 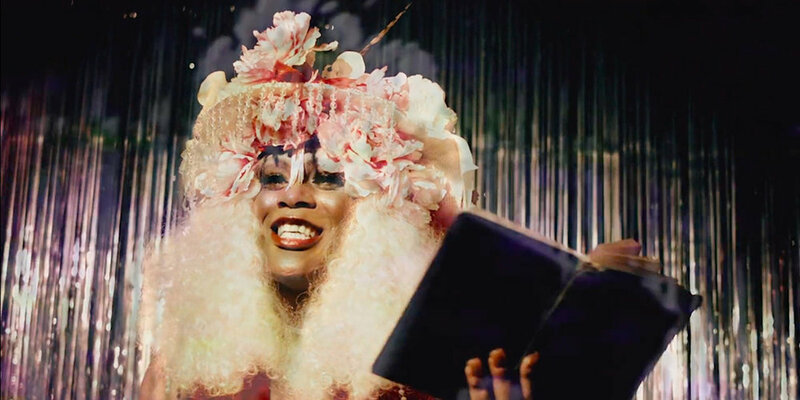 On the occasion of the New York premiere of their new collaboration Happy Birthday, Marsha!—about legendary transgender activist Marsha P. Johnson—this program brings together a selection of quietly radical short films by Tourmaline and Sasha Wortzel, which offer moving considerations of queer and trans identities both past and present. Reina Gossett and Sasha Wortzel, Happy Birthday, Marsha!, 2018, HD video, color, sound, 14 minutes, 24 seconds. European Premiere of Happy Birthday, Marsha! The New Museum publishes Trap Door: Trans Cultural Production and the Politics of Visibility, the Latest Installment in the Critical Anthologies in Art and Culture Series. Edited by Reina Gossett, Eric A. Stanley, and Johanna Burton. Available for purchase from MIT Press here.